This is a large sample of our COLLABORATIVE LEARNING IN ACTION resources. Try this sample PowerPoint in class. Watch you kids become engaged as they enjoy the visuals. Hear the lively discussions, questions, and problem solving, -- and laughter as your students master the state standards. • Interactive PowerPoint designed for computer/doc camera and Smart Boards. • No Prep format: Plug in computer and go. 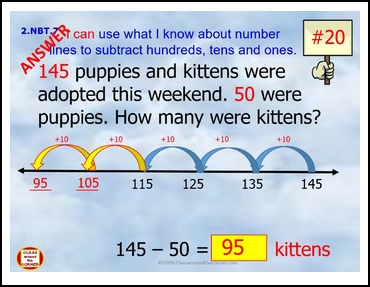 • 10 sample Word Problems to promote fluency, collaboration and accountable talk. • Adherence to state and district standards. NOTE: This PowerPoint Interactive resource is designed to be used in the Slide Show View. Please follow the instructions on slide 2. Give the students time to enjoy the animations. Try out the engaging problem-solving tasks with eye-catching visuals. These classroom-tested products have generated excellent feedback. A quote: “I couldn’t believe how engaged the kids were in talking about math.” They support research and best practices. You will see your students become participants as they problem-solve and receive instant reinforcement on correct thinking about math. The sample word problems progressively develop the State Standards with progressive “I can” statements. This is perfect for Student Math Ambassadors. Click to view the full version of 2.NBT.7 Add and subtract within 1000.